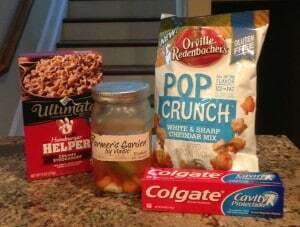 Gluten free chocolate chip cookie dough, pickles, toothpaste, popcorn and Hamburger Helper may sound like an interesting if not bizarre grouping, but they are all the hot freebies I scored this week thanks to my local Kroger store. All of these helped me add to the savings in my weekly savings chart. Three of the five items, Colgate toothpaste, Orville Redenbacher Pop Crunch, and a box of Ultimate Hamburger Helper I scored by downloading free coupons to my store loyalty card. The remaining two items, Vlasic Farmer’s Garden Pickles and Pillsbury Gluten Free Cookie Dough, I snagged through a coupon giveaway sponsored by each company. As a side note, I was pleasantly surprised at how delicious the gluten free cookies were. I don’t tend to purchase gluten free items, so I was slightly concerned that they may taste or look different, but I experienced the contrary. The chocolate chip cookies were still moist and delicious. Though my family enjoyed the cookies as well, my husband is convinced I loved the cookies so much because they were free! I can’t help it, who doesn’t love free food? Ok. This week’s savings chart entry is not nearly as sizeable as last week’s (check out Week 1: Savings Chart: My Home Refinance), but I am still pretty pumped about the freebies I snagged. Till next week-Happy Saving! Join me by downloading this free printable savings chart. See my latest savings chart entries for more!